Billy Coffey‘s critically-acclaimed books combine rural Southern charm with a vision far beyond the ordinary. He is a regular contributor to several publications, where he writes about faith and life. Billy lives with his wife and two children in Virginia’s Blue Ridge Mountains. 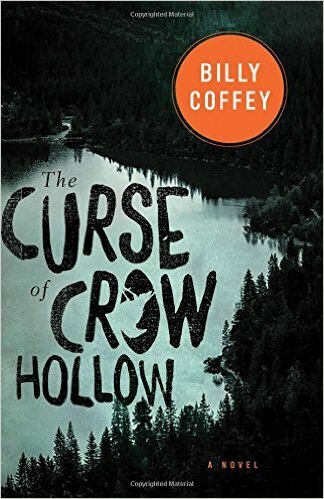 I was looking for a spooky read for October and I got more than I bargained for in Billy Coffey’s latest novel, The Curse of Crow Hollow. It is indeed a spooky and chill-inducing read, but it is so much more. With its Southern gothic style, its impeccable characterization and Billy’s trademark story-telling, this is a book that will do more than give you the creeps. It’s going to make you think and continue to think long after the last word is shared. Crow Hollow, Virginia is a small town on the way out. Not many are left in the Hollow — jobs are scarce and its back-woods atmosphere is not likely to attract people or industry. It does have a close-knit community full of gossip, resentment and past sins. And there is a witch on the mountain that overlooks the town. This town is trouble just waiting to happen. The Curse of Crow Hollow has a first person narrator who is not identified until the end of the book. He is down-home friendly and candid in his description of his fellow citizens. He describes to a visitor what has led up to the current state of the town — burned down buildings and few remaining residents. It’s a ghost story of sorts that begins when four teenagers tangle with the witch and unleash the curse on the whole town. As the story unfolds, the reader is made aware of hidden sins and secrets, deals struck and promises broken. Jealousy and prejudice abounds, though no one wants to acknowledge it, let alone confront it. The whole persona of the town and its people is a mask hiding the ugliness of those determined to go their own way. The town has embraced its isolation from the outside world and from God, although they would never admit that. The curse that takes hold of the town is of their own making, and the evil that has taken hold is not likely to let go any time soon. A few townspeople are determined to make a change and in the end, the reader knows the fight continues, and a sliver of hope remains. The Curse of Crow Hollow is definitely fiction, but completely on the mark for the hypocrisy of a religion without true faith and lives full of sin without repentance. It is riveting and soul-convicting. Do you like scary books? Why or why not? This book would be way out of my comfort zone, Beckie, but you almost have me persuaded to try it sometime. I take note of anything you “very highly recommend,” so I may have to come back to this one. I’ll be finishing “The Hardest Thing to Do” today and it is really good . . . Every book in the series has been so far. Sounds perfect! Going to TN. Halloween weekend, right through VA. Will see if the library has this one on Audio for the trip down! Thanks! Hope you enjoy it. Some reviewers said it wasn’t “Christian” enough. I thought the message subtle but spot on. Sort of allegorical.